I recently heard an interview of the author of the new book, Carsick on NPR. A story by John Waters describing a recent cross country hitch hike by the 60 something author. Apparently the book has three parts. What happened, the worst that could have happened fiction and the best that could happen fiction. The interview revived memories of my hitchhiking days in the early to mid 1950's. My experience with hitchhiking was a mixed bag of good, average and down right terrifying. In those days, it was common for college students to hitch rides. Few of us we able to own cars and transportation to home from college was was not very convenient via public transportation. (Although after a few bad hitchhiking experiences, I did resort to train and bus rides). For the most part I had rides with cordial, friendly and helpful drivers. Often they would go out of their way to get me to a new intersection for the next leg of my journey. However, there were the terrifying experiences of being picked up by deviants. ( I will not go into detail to describe). Fortunately I was able to escape those encounters when there was a stop light or stop sign halt. In some cases it was wise to travel with a friend, even though it was not as easy for two to get a ride. In another one of my experiences I learned that not is all what it seems to be and I was too hasty in fearing for my safety. For the last leg of my journey home to Lyons, New York from Geneva, New York I was offered a ride by a near car full group of Spanish speaking migrant workers. The driver seemed to know only two ways to drive. Full brake or full throttle. As we were tearing down the road at breakneck speed he suddenly said something to his front seat companion. After the reply from his companion he suddenly slammed on the brakes and jumped out the car, came over to my side rear door and yanked it open. I immediately thought that I was going to be mugged. However, much to my amazement, he thought the door had not been fully closed, and he simply slammed it a few times, jumped back in the driver's seat and tore off down the road again. I guess my heart rate dropped quickly. Actually I was grateful to get to my destination with such a jovial group. Jumping to 2014, I am reminded that hitchhiking seems to be a lost art and probably a good thing. The interstates likely have significantly reduced the opportunity to hitchhike. Also, we seem to be living in a more violent world than that of the 1950's. 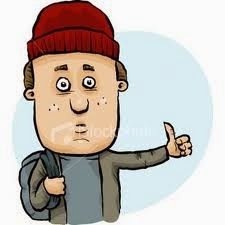 Maybe, hitchhiking exists in some places in the USA, but during the over 6000 miles Nancy and I traveled over the USA last summer on many secondary roads, we never saw a hitchhiker. Ah, well, I do wonder what it would be like to be a geezer hitchhiker today. Maybe the best thing I can do is to read the book Carsick rather than conduct a field experiment.